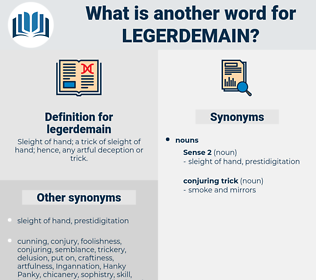 What is another word for legerdemain? Sleight of hand; a trick of sleight of hand; hence, any artful deception or trick. truth, openness, truthfulness, frankness, uprightness, honesty. candor, artlessness, plainness, guilelessness, forthrightness, candidness, directness, plainspokenness, sincerity, ingenuousness. 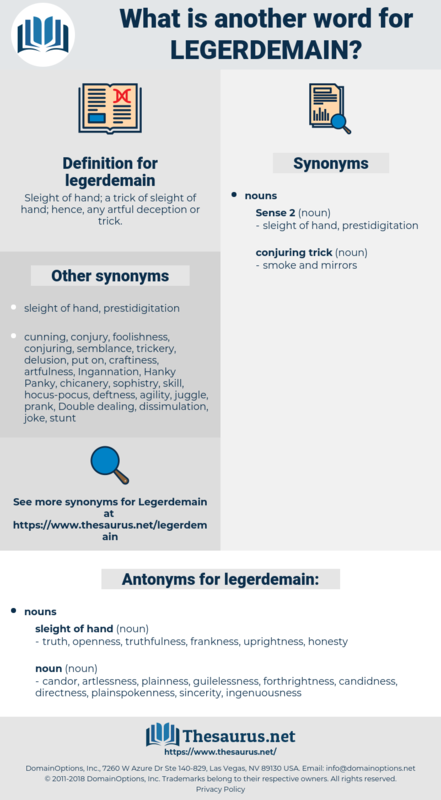 Could it really be the case that the man intended to perform so audacious a trick of legerdemain as this for the preservation of his power, and that if he intended it he should have the power to carry it through? Everybody knows that Election day anywhere creates an unusual excitement; but it is in the large cities where partisan feeling runs the highest, where strongest and strangest influences are brought into requisition to influence the election of favorite candidates; where the people are made to act as blind confederates in a skilful scheme of party trickery and political legerdemain, which places one man into office, and defeats the expectations of another, whom they fully expected to see invested with the imaginary robes of municipal power. leisure time, Luxuriation, logarithm, laceration.